Take a trip back to Docklands during Medieval times and there would of course be a huge difference in what you would see. The landscape of skyscrapers and ultra modern glass fronted buildings is a far cry from the undeveloped, dirty and probably pretty smelly Docklands back then. Even so, Docklands then, as it is now, is at the very heart of the capitals national and international success. Another far more pleasant aroma that could have been drifting on Thames air in those medieval times would have been that of a hog roasting on a then state of the art spit poles. Hog roast Docklands would have been a busy and thriving area and the chances are that some of those people doing very well from the business conducted there would have celebrated with such a feast. Maybe Charles Dickens chose to partake in hog roast every now and then, as he frequently wrote about the Docklands area. Back in the twenty first century, hog roast is enjoying something of a renaissance and hog roast Docklands is seeing this Medieval feast reborn as a the perfect meal for those all important corporate and business events where great tasting food is not simply ideal: it is essential. Take a look at some of the businesses located in Docklands and you’ll not see corner shops but huge multinationals. When events are organised with these businesses in mind. They need to deliver the goods. Thankfully, a hog roast Docklands event can strike the right balance every time. Hog roast may seem an unusual choice at first. After all it’s an old feast, without the bells and whistles of eighties event food. But Times have moved on and hog roast fits the mood perfectly in the new century. Hog roast is a back to basics food. No fuss, superb tasting food that requires none of the myriad additional flavours or garnishes that eighties catering was so fond of. 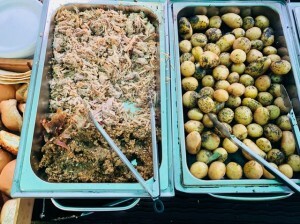 Hog roast relies on simplicity of ingredients, preparation and flavour. We recently catered at a house in docklands for just 12 guests but rest assured the same dedication and professionalism went into preparing the same high quality catering as you would see at any of our events, large or small. We arrived in the late morning and began preparing the feast for the guests which was spit roasted turkey with seasonal vegetables and new potatoes in herb butter. The guests were very happy to hear that all of the food had been freshly prepared on site, in the back garden in fact. We took a back seat as they stormed through the meal like it was their last supper. 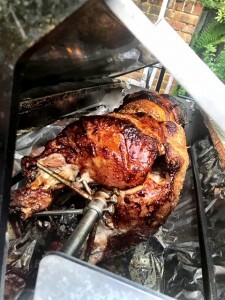 When it comes to the ingredients, the Docklands hog roast chef chooses very carefully, selecting only the very finest quality pig from a reputable source. A quality pig is key to a good hog roast, for without a good pig there is nothing. Preparation is a performance in itself, as you would expect from a meal that needs to impress. The whole pig is very slowly roasted on the imposing hog roast machine, a superb piece of equipment that is the modern equivalent of the original spit. The whole pig will then spend a slow six hours roasting away, giving all those incredibly juicy flavours plenty of time to sink right in to the meat. The hog roast chef can then prepare your meal to be served with total professionalism. Beautifully carved and served with apple sauce, stuffing and incredible crackling, a Docklands hog roast really is a complete dealmaker of a meal. 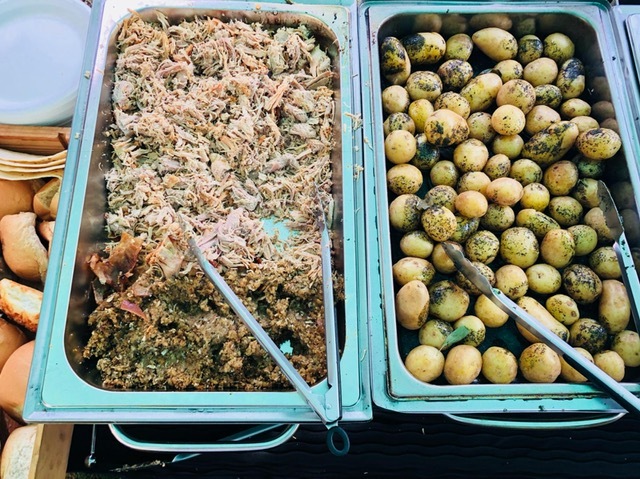 If you are out to impress colleagues, associates or potential new clients, hog roast really is the catering option that you should be counting on.